Mykonos island is Vivid and lively round the clock, promising long days and longer nights! 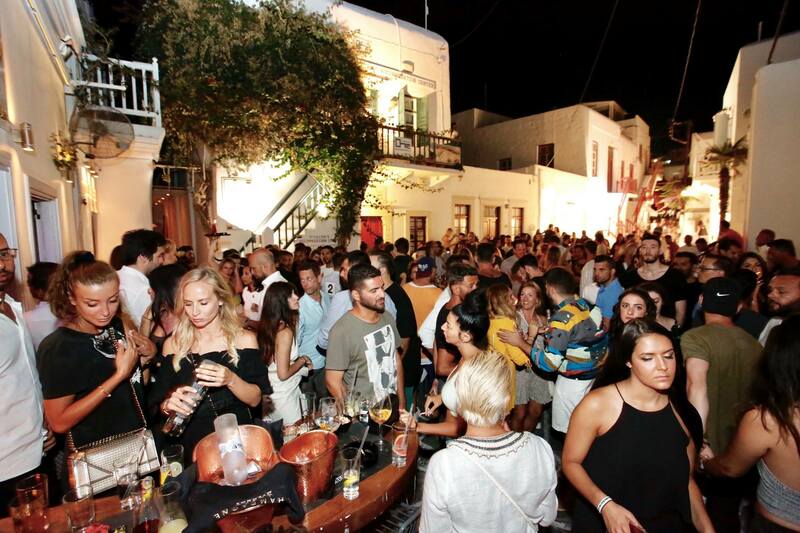 Here are some of the best tips to make the most out from the non-stop, Mykonos Party! You can find numerous of cheerful and crowded bars and clubs that party all day and night long! Εspecially on the southern coast of the island, while the Town also offers a non-stop party atmosphere. If you are wondering where to party in Mykonos, here are some suggestions. Scattered around the streets of Mykonos Town are many clubs and trendy music bars for all styles and preference. Even some of the restaurants, cafes, fashion and jewellery shops stay open until late at night. Mykonos town has a special vibe, inspiring everyone for a great time, with parties lasting until sunrise! At evening people usually head down to the lively Little Venice area, where there is a wide variety of bars, clubs, live events and many more. The whole area around Little Venice is a perfect place to watch the sky changing as the sun sets. Whilst enjoying a refreshing cocktail or delicious meal you can admire nature’s paintbox as she turns day into night! With colors that alter from ultramarine to turquoise, pink, gold and then to the deep blue of the night sky. Once the sun sets the crowds begin to disperse slightly, to embellish themselves for the night ahead. A bit more late at night, you can head down to the most busiest junction of Mykonos Town, between Matogianni and Enoplon Dinameon Streets. Here is one of the best places to enjoy a drink and watch the colorful crowds passing by. Increasing in density and ‘peacockery’ as the night goes on, it is sure that you will have an unforgetable time! Now, if you want to dive deeply into Mykonos hot nightlife, you need to walk towards Lakka area! Here the young crowds of 20 something or even less are enjoying world known DJs, setting the decks on fire. Mykonos is also a well-loved destination of the gay community too, with many hang-out spots, especially during September. Most of the gay bars in Mykonos Town are gathered behind the Town Hall and in Kastro area, organizing fabulous drag queen shows, theme parties and other events! So whatever your preferences are in partying, Mykonos Town will not disappoint you! You will find out that during the day, the beach bars and clubs in Mykonos are full with crowds. Especially in peak season, with people who want to have fun and enjoy themselves. Most beaches on the southern side of Mykonos are organized with many tourist facilities. Furthermore they provide a convenient entertainment venue close to hotels, restaurants and water sports. On Paradise beach there are some of the most popular Mykonos nightlife venues globally, as regarded by music industry publications, artists, clubbers and also regularly voted in the top clubs annual list. Every summer you can find amazing line-ups of djs and producers from all genres of the electronic music scene. Some well known names are: Carl Cox, Deep Dish, Sasha, Little Louie Vega, Erick Morillo, Sven Vath, Roger Sanchez, David Morales, Richie Hawtin, Steve Aoki, Steve Angello, Tiesto, Ricardo Villalobos, Maceo Plex and many other famous djs! Other stunning beaches with active party life are Psarou, Paraga and Kalo Livadi beach. Beautiful organized beaches with beach side restaurants and bars that turn into crazy party scenes in the evening. The famous “Mykonos Party” atmosphere will for sure enrich your summer holidays, making your visit to the island a truly memorable experience!